... and then all of a sudden. 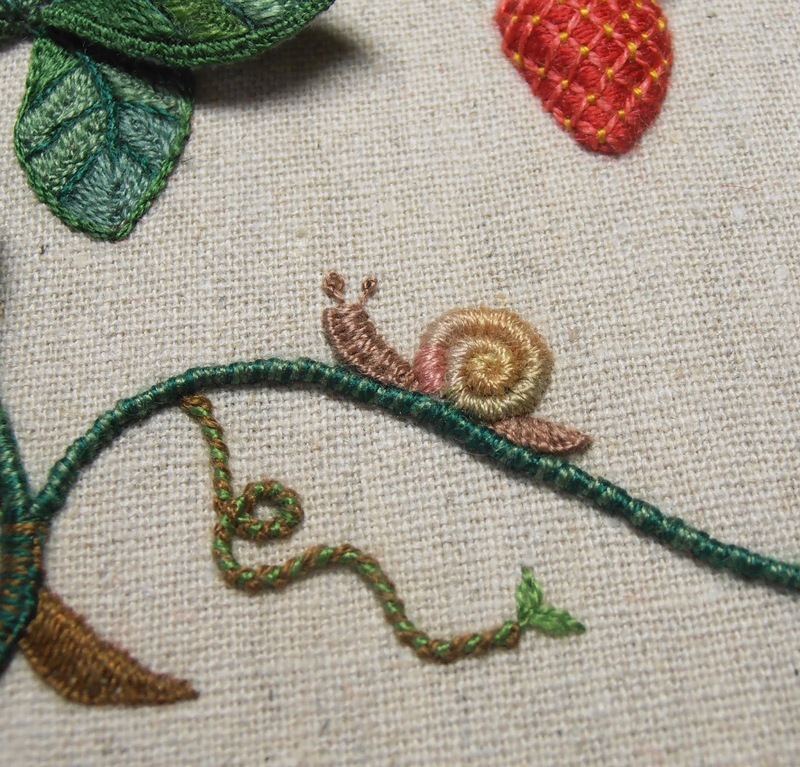 There was a snail, eyeing off the fat, juicy strawberries. He will get there, slowly, slowly. Above, drawn in by the sweet scent of strawberry flowers, is a busy bee. She is the same I have done before (HERE) except I made stitch the wings much simpler - just two little silk ribbon loops. 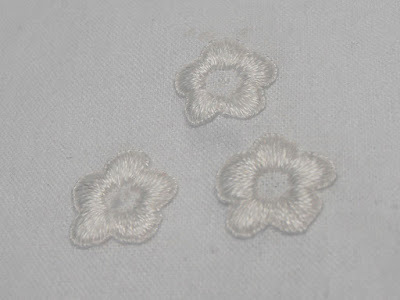 The, before hard to see, flowers have been cut out and stitched in place with fluffy, tufted Ghiordes knot (Turkey knot) centers. Last, but not least, the four wired leaves. Also cut carefully cut out and stitched in place. And so, slowly, slowly, I got there. My 'Strawberry Feast' is finished. Thank you so much for all lovely comments. I wish you all a Happy Easter and a lovely, relaxing, peaceful long weekend. Autumn is slowly creeping in, and even though we had a few tiny drops of some 'wet stuff' from above it is only just enough to settle the dust. It is so dry still, that even the deciduous trees that normally put on a beautiful autumn display are struggling to put colour into their leaves. 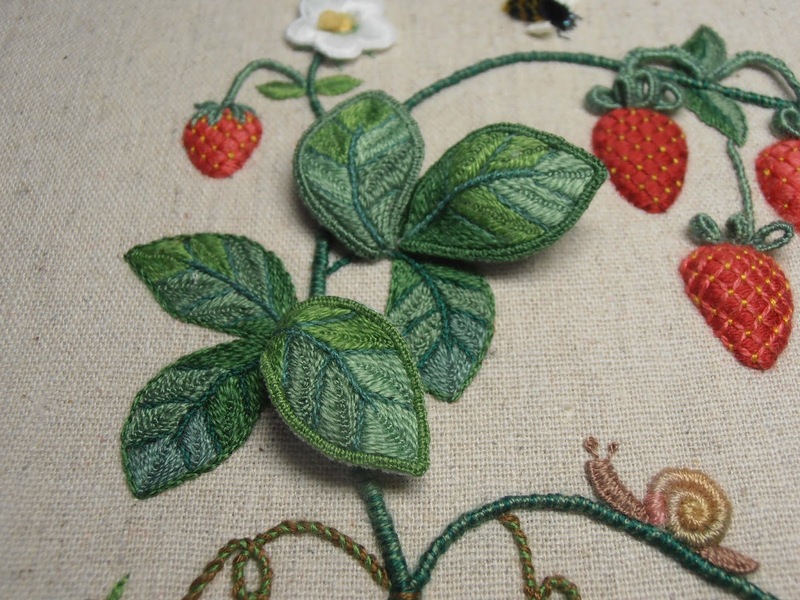 I have not quite finished my strawberry plant as I had hoped, but I am getting very, very close. 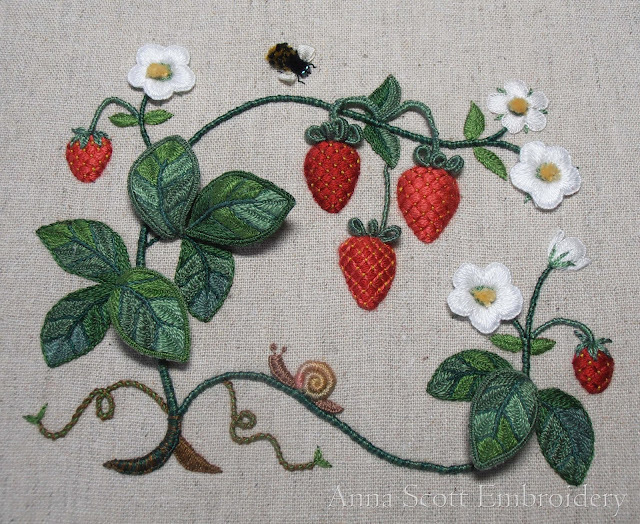 The strawberries are finished though, so all I have left to do is two little 'critters' and I am ready to attach the leaves and flowers. I had not quite planned how I was going to stitch them before I started (as usual). 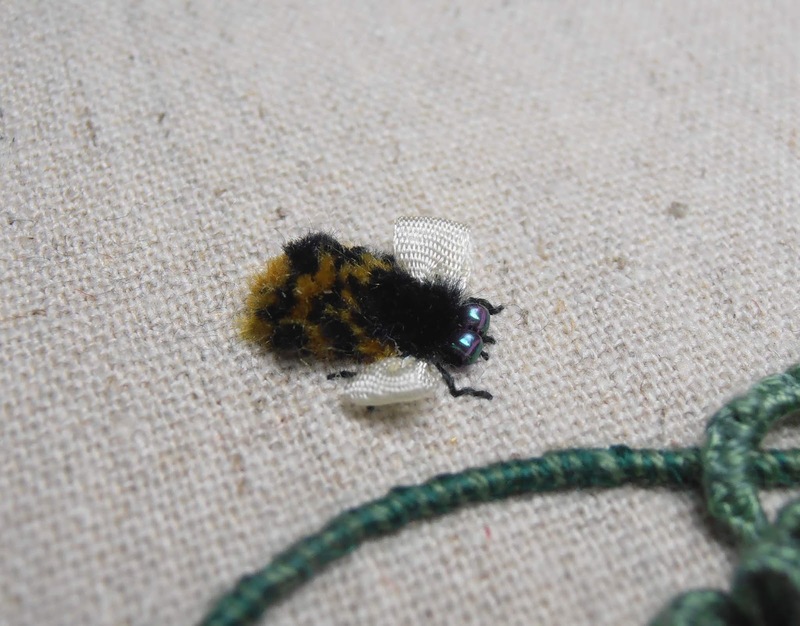 I knew, I wanted them really nice and plump and was toying with the idea of embroidering them separately and stitching them onto the main embroidery later. After a bit more thought I decided to pad them well with felt directly onto the main piece instead. 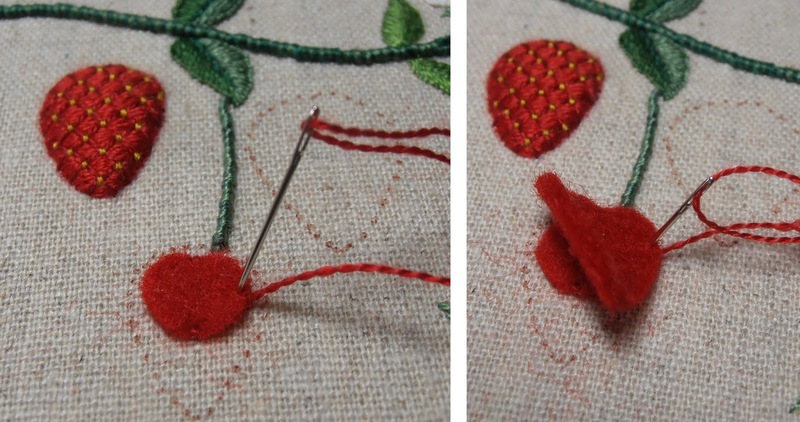 All the strawberries are padded with one or more layers of felt to get them nice and plump. It is near impossible to trace a shape onto felt. In the past, so what I do, is trace the pieces onto baking paper. I then cut the tracing out, leaving just a narrow margin around each shape and sticky-tape it to my felt. I can then cut the shape out on the marked line and get a the exact shape and size I need. 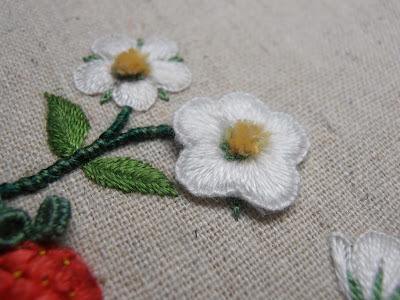 In the past I used applique paper for this task, but this method saves me dragging out the iron which I really like. Once the pieces are cut out, the they can be stitched to the shape. If there is more than one, the smallest padding pieces (almost) always goes on first. This is to create a nicely domed shape. The piece is just held in place with a few stab stitches. By bringing the needle up though the fabric at the edge of the felt and down through the felt shape, I avoid accidentally shifting its position. The larger shape then is held in place in the same way over the top. To get a smooth edge on the felt it then needs to be stitched down all the way around. 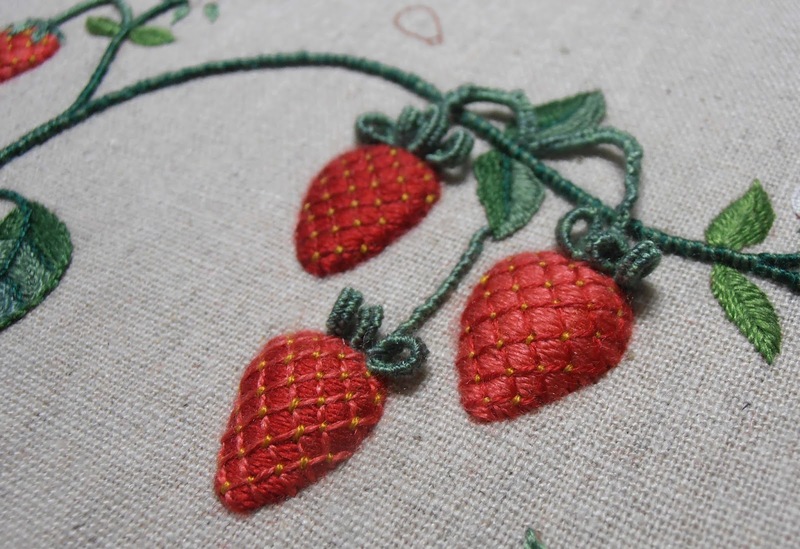 It can be done with small stab stitches close together, but for these berries I used blanket stitch. 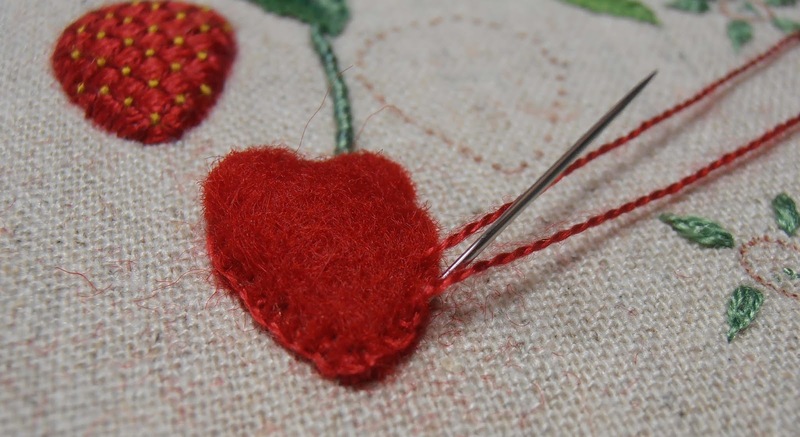 I find blanket stitch gives me a smoother edge, which is particularly useful when I will be covering it with satin stitch. The strawberries are all covered with satin stitch - a little tricky because they are so domed and the stitches were sliding off on the edges. 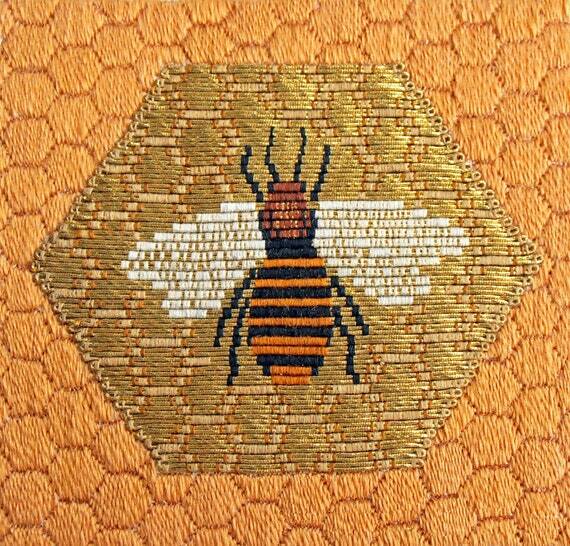 Over that, I added a trellis that is couched down with tiny golden coloured stitches to represent the seeds. I used the same three tones of red for all the berries, but changed the colour combination on each berry, to get subtle variations. To finish the large berries off, I added picots at the tops - the middle berry needs one more on the left hand side, I think. So this is how it looks by now. The spiral / circle on the lower stem will be turned into a hungry little snail and the strange shape at the top; a busy buzzing bee. That should be fun! 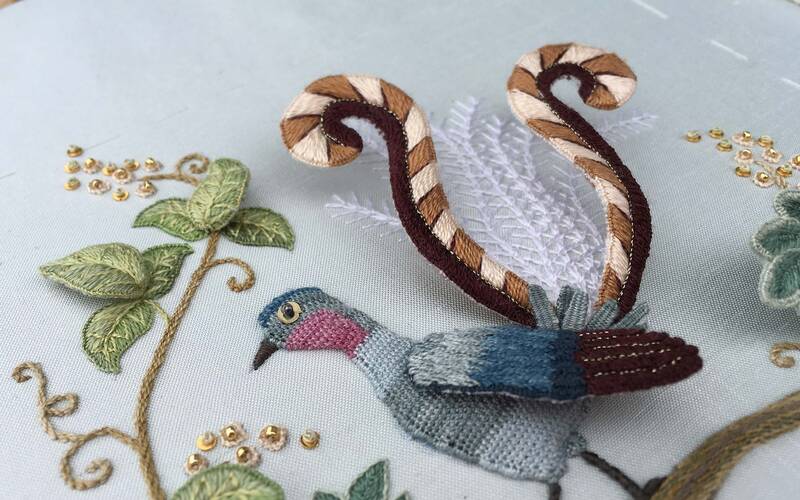 If you are in Adelaide, and would like to have a go at raised embroidery, there is still a few places left in my short course starting 8th of May. Just email me for more information. I hope you are enjoying a lovely weekend, finding or making time to do what you love most. 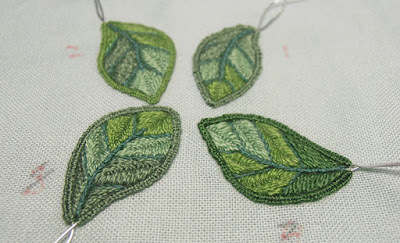 I have been stitching leaves, leaves and more leaves and almost called this post '50 shades of green'. 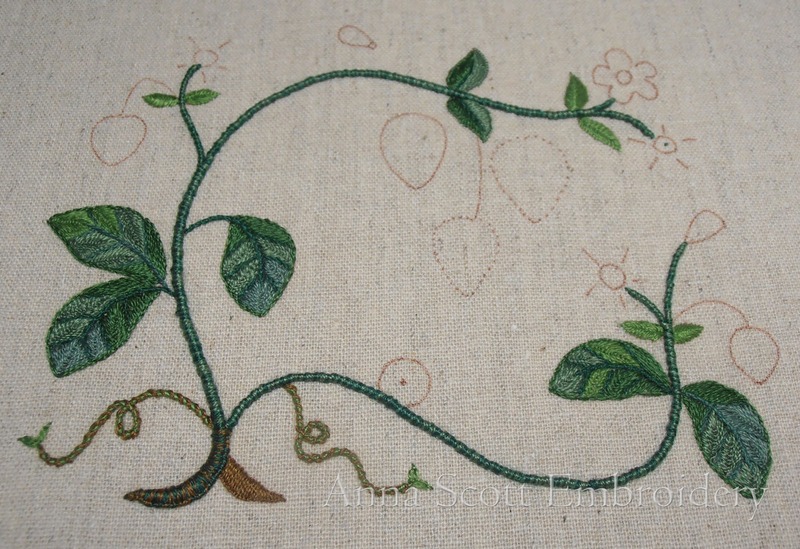 The leaves I showed you in My Last Post are now finished, with fine wire and blanket stitch edges, ready to be cut out and attached to the main embroidery, once that is done. 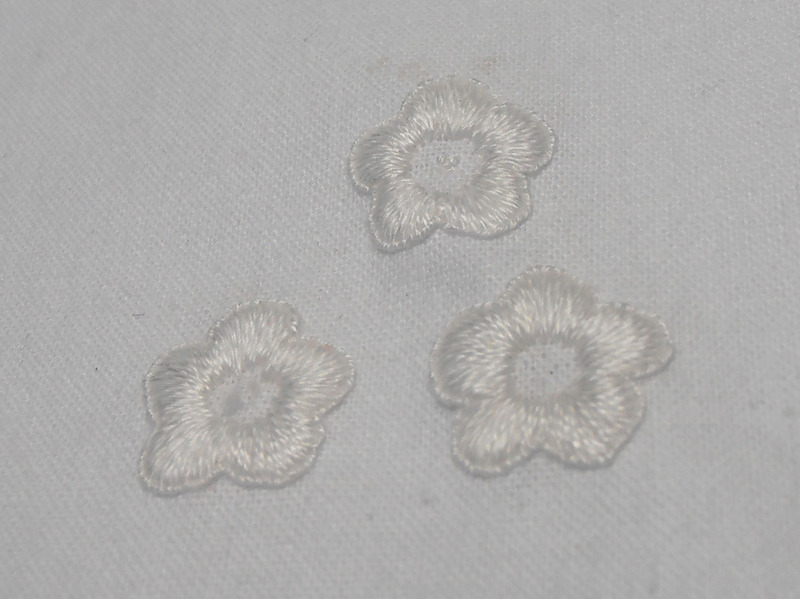 Three little (tiny) white flower shapes are also ready. Each flower is only about 15mm (5/8") across, so they really are quite small. Photographing white on white is near impossible, but I hope you get the idea. I will talk more about these later, when you can better see what is going on. 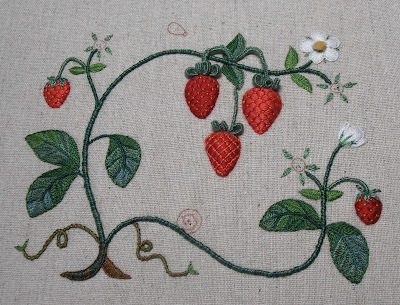 I am still pondering whether to embroider a couple of my strawberries as 'slips' to get them really raised. 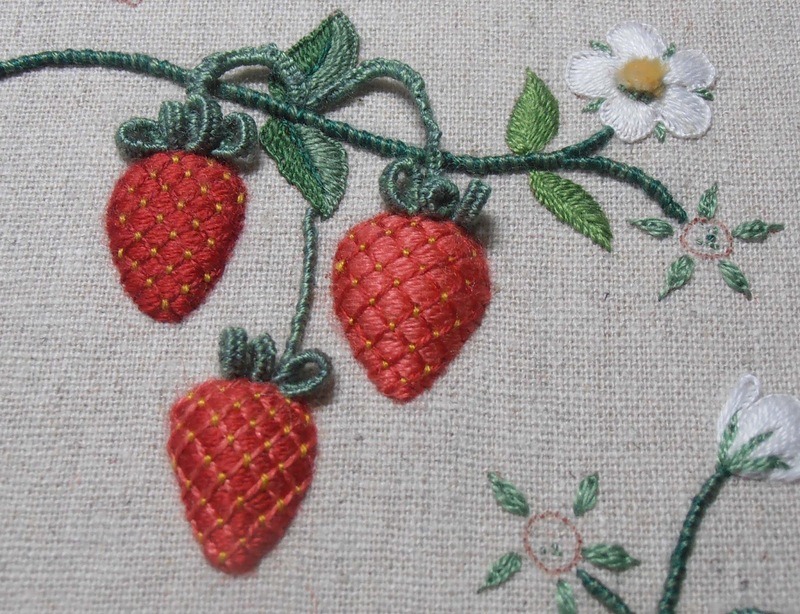 Rather than spend time stitching samples, I decided to embroider the strawberries that I know will be on the main embroidery first. That way I will be able to gauge if I need to do a couple separately or if I can achieve enough raised effect simply by adding multiple layers of padding. But I can't embroider the strawberries until the stems and leaves are done. I used my trusty old stitch combination of whipped stem stitch for the stems (the top one in the photo). I like this combination because it gives me slender stems that are still quite raised off the fabric. ... you guessed it: Leaves, leaves and more leaves. The large leaves are all embroidered in much the same way as the detached leaves in the Previous Post. Since they won't be cut out, they don't need the blanket stitch outline, so I neatened the edges with stem stitch instead. I have a rather substantial stash of green silks: yellow greens, olive greens, khaki greens, blue-greens, grey-greens... the list goes on - yet, getting the greens just right was not completely straight forward. 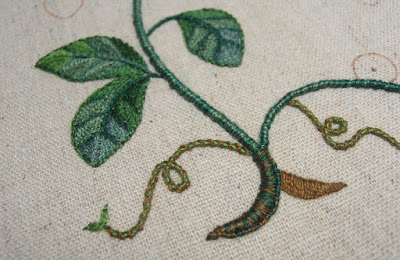 I had to stitch one of the leaves twice, because I just didn't like the combination / distribution of the green shades... Sigh - I wish I wasn't so picky with these things! This is where it is at. So far, so good, and I must confess I am looking forward to using a few other colours than green next. I usually stitch my raised embroidery on silk, but for my Strawberry Bush , I have chosen to use this natural coloured Linen/cotton blend. 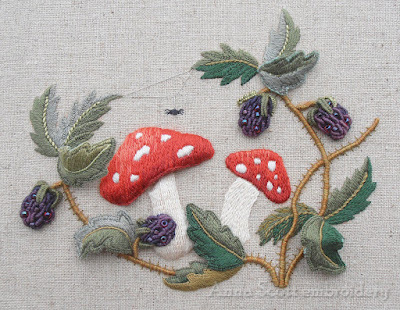 The style, shape, size and colours of the Strawberry Bush are very similar to my Toadstools & Brambles and I am hoping the two pieces well make a nice little pair, so it made sense to use the same fabric. Now that our grape harvest is over (yeah!!! ), I hope to be able to finish this project in the next week or so. As you know, I have a terrible habit of setting myself crazy deadlines so time will tell how I go. Either way, I hope to have more to show you next week. 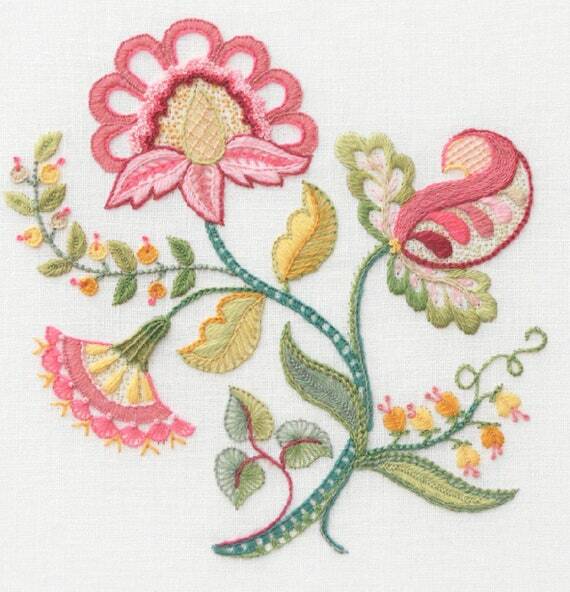 Until then, I hope you have a wonderful weekend and find time to stitch or do something else you really enjoy. I am Anna, how nice of you to stop by. My life is in stitches - literally. I embroider whenever I can find time, or make time. 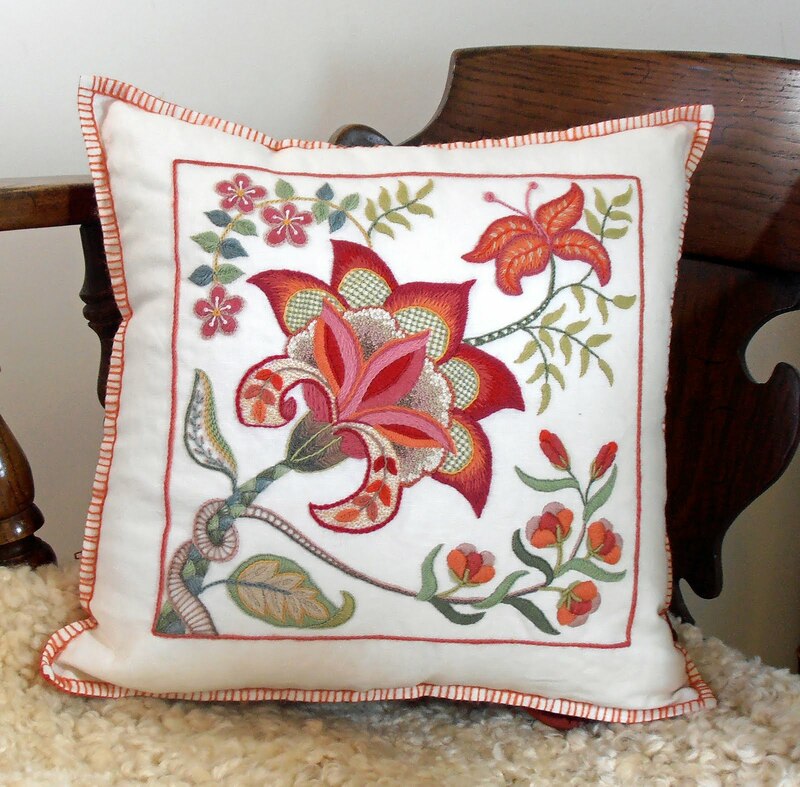 If I am not stitching, I am most likely thinking about it. It is lovely when people find my content interesting and want to link to my blog or to a specific post - thank you! Please keep in mind, that all images and content is created by me (unless otherwise noted) and I'd appreciate if you respect my copyright and hard work by not taking them without asking. If you have any questions, just email me on annascottembroideryATbigpondDOTcom and I will get back to you as soon as I can.